Do you know that you need to create better content but working it all out gives you a headache? I’ll tell you a secret. It’s actually not hard to be awesome, it is a process just like any other in your business. A content strategy will give a new lease of life to your business and ensure that you work most with the people who love to work with you. The difference is, that if you have an awesome content strategy, your clients will come to you instead of the other way around. When I work one-on-one with clients I help them work out exactly what their brand is about, who they need to speak with and how they can create better connections through every form of content. I’m going to walk you through that process, and there’s a case study and video testimonial on how I create content strategy, so scroll to that if you’re short on time. If this is all mysterious to you, let’s begin at the beginning. What is a content strategy and what do we mean by content? Whenever we’re conveying what we do to the world, how we do it, or why we do it we are creating content. Content comes in the form of social media, websites, flyers, brochures, business cards, video and the list goes on. You might be creating visual content like logos, pictures or video. Or, like me, you might be creating content in the form of words. I love helping people with this stuff because for me, words are fun. I love playing word games, I love writing and designing for clarity and beauty. I get a lot of joy out of helping people say who they are and why they are amazing more clearly than ever before. It’s important to realise that every form of content tells a story about who you are, what you do and why people should work with you, or not, just like I did. It’s the or not that often gets you. People will work with you … or not. It’s a quick decision. We all make snap decisions based on how fast we can get the information, and how quickly we understand that it’s exactly what we need. When someone loads a page, or reads a blog we now have about 1.2 seconds to grab attention. Creating better content that is easily consumed is essential to getting more clients more easily. As a Digital Strategist, content strategy and branding is the journey that I take my clients on every day. What underlies content strategy is also having a brand that visually represents you, so the case study below also covers branding. The following 7 steps are the process that I use to ensure that my client will get a viable return on the work we do immediately. 1. What Kind of Business Are You Really? Before I start writing for my client I begin by understanding what kind of person they are. Understanding what language is going to serve your brand is key. When someone picks up the phone they speak to you, and so the language that you speak is the language of your brand. Your website, your content, your business should look and sound like you. That way there is no disconnect when someone is attracted to you. 2. Who Do We Want to Appeal to? Who is that ideal person that works well with us, loves what we do and enjoys the outcome that we provide? Now sometimes, these first two ideas are already out of alignment. Our business and our brand looks and acts a certain way and we want to attract clients that aren’t going to be attracted to the way we look and sound. Colours, logos, font and content are all key to making that alignment happen. When we write for our clients, the only thing that matters is to you as a reader is “what’s in it for you”. Nobody comes to your website, blog, brochure or business card wanting to know what you do. More than ever we had precious little time, so the main thing we hear or see that we retain is solutions. If you can easily and quickly inform your ideal clients that you were going to solve their problems, that client is yours. 4. Can Your Client Get Help Immediately? We review how easily your clients can access solutions to their problem. Are you putting content in the right places, are you showing them who you truly are, all are you just pitching, spraying and praying? Creating content that matters to your clients and making it easy to access is the biggest, easiest way to add value and create ongoing clients. A truly awesome business has happy clients. Getting video testimonials or written testimonials is so key to creating trust on line as that’s someone else telling others you are worth working with. Ask for the quote, the google review, the LinkedIn or FB rating, and make it easy for someone to create that for you using links or feedback forms or doing an on the spot testimonial on your phone. Maximise the visibility of your brand by having others rave about you. People love to know a bit about you and get something from you for free. 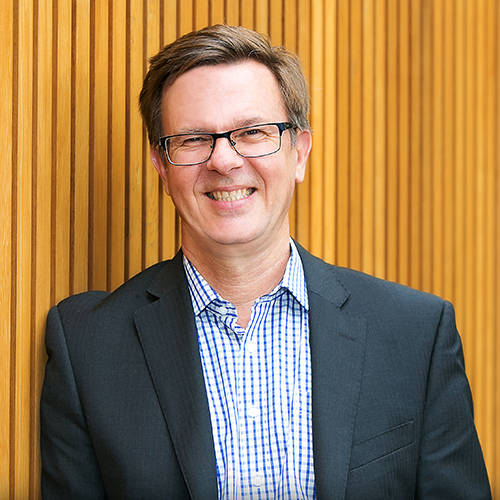 If you email me, or SMS me I’ll offer you a complimentary ticket to my content workshop (Melbourne, Australia) – there’s one coming up soon. We will put into practice the first few steps of this strategy so that you can get started. 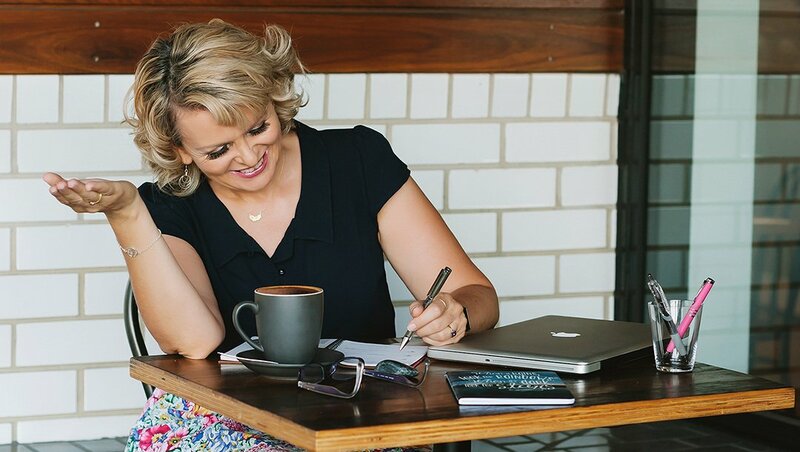 I can’t wait to deep dive into content where everyone loves the outcome, just like the following video shows, with multiple business owner Debbie, who runs Sassy Legs and Empowerment Point. Here’s a hot tip: Existing clients buy more often, buy in greater volumes, and require less marketing expense, because they already love you. So, having an ongoing program of loving your existing clients with viable content is essential. Create ongoing communication that adds value to your clients so that they come back to you more often. My client Kirk is a buyer’s advocate. Initially we began to work on who he worked best with. He’s a naturally gifted conversationalist, he is funny, and he’s very diligent and looks after his clients. Kirk finds that he works really well with corporate women and empty nesters. Initially, Kirk’s website talked about what he did. There’s plenty of buyers advocates out there, so nothing particularly stood out. The banner was a composite shot with Kirk popping out the side (it was not awful and not brilliant). The logo was just words, medium blue, fairly old-fashioned text. There was no softness to the brand and the photos didn’t really show Kirk at his best. There was nothing to demonstrate the depth of expertise that Kirk has or the trust he generates with these clients, in part due to a good heart, in part due to his military background, which sees Kirk being disciplined and responsible to all his clients. We began with Kirk’s messaging. He is a caring person who hand holds and does the extra mile and is quite multi-skilled with an extensive background in property management as well as sales and advocacy. 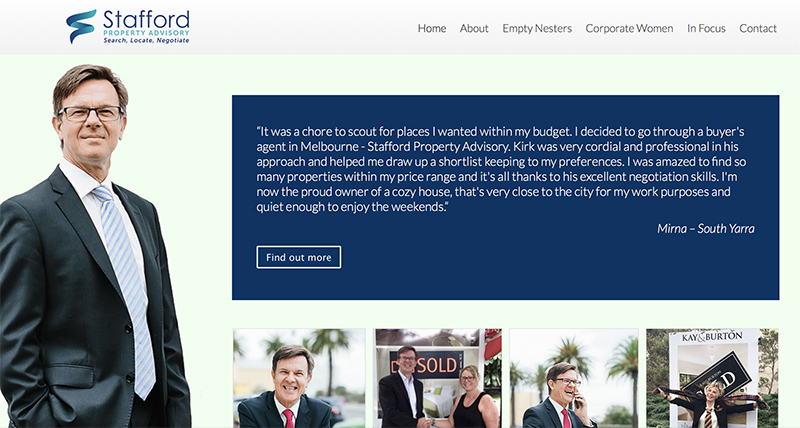 We updated Kirk’s About Page, with his RAAF background, his extensive Real Estate Experience and his passion to serve with integrity. Then we focused on case studies and testimonials and wrote great stories that demonstrated his work with his ideal clients. We also planned and in phase two created pages that are specific to Empty Nesters and Corporate Women. Next we looked at Kirk’s brand and his website. We redesigned the site from scratch, new logo and branding guide, new photos. We also included a radio interview that he did, which is key to knowing who Kirk is and how he works. It’s so easy to see the likeable, accessible person that he is now on every page. A new brand creates a user experience that truly expresses how Kirk serves his clients. There’s multiple ways to contact Kirk and it’s easy to find out all about him. Links to socials, email sign ups, blogs are all part of the ongoing strategy. Kirk’s client photos are exciting, as are his written testimonials. There’s no doubt that his clients have gained great value, will work with him again and love what he does. Kirk now has an E-﻿﻿book on property that you can get your hands on for free. I’ve read it and it’s really very awesome, actually written by him. It is totally insightful and practical reading for anyone thinking about bidding at Auction. Our final step is to get Kirk’s blog up and running regularly. He is already offering great value through an email letter. I’ve no doubt that his dedication to being the best in his field will add great value to anyone looking to find an investment, buy or sell and to enter the world of auctions. He also offers property management for clients who do invest in property and have some concerns about who will manage the process from there. Kirk is now represented by a new brand, new photos, different colours and his brand appeals to the two client bases that he finds work well with him. It all began with a content strategy, which is how you get excited about your business and ensure that you focus on working with the people who love to work with you. If Content is still something you want more information about, we educate through 1:1 and workshops. We also offer a ‘done for you’ service for all your content needs. We run workshops every month on the keys to getting found, more leads, better clients and how to have a client that loves to buy from you and does so easily. My next article is on how The Mehrabian Principle is the Key to better content marketing in the next exciting installment, with love, from Emma @ Digital Copywriting.